Obituary for Reine M. (Bercier) Sorokey | Ray Funeral Service, Inc.
Reine M. Sorokey, 92, succumbed peacefully, after suffering from bone cancer, at home Tuesday, March 20, 2018, with her loving daughter, Pamela, by her side. Reine was born in Reims-Bethany, France on July 3, 1925. She graduated from high school in Reims. Reine worked as a governess, a document classifier, and worked in a light bulb factory making filaments until the Germans in WW II occupied France, and were going to take Reine to Germany because she was such a hard worker. Consequently, she quit her job to avoid being sent to Germany by the SS Officers. Reine and her family survived several attacks by the Nazis and, as a result, became refugees. Reine was working in the Pieniage Co. when her friend introduced her to her future husband, and love of her life, Eddy, who was in the US Army. After a week Eddy was transferred back to the States to re-enlist and returned and asked Reine to marry him, on April 18, 1953 at St. Andre Church in Reims. 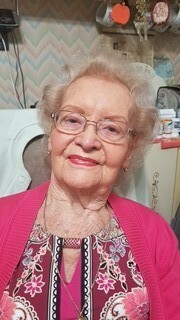 Eddy and Reine lived in Germany for the next two years until being transferred to Fort Riley, Kansas, where their daughter Pamela was born in 1955. The family moved to Hudson, New York and in 1963 moved to Schodack, New York for the remainder of her life. Reine was a phenomenal cook, kept an immaculate home and enjoyed gardening, knitting, crocheting. Reine was an animal lover, especially to Mango, Misty and Sugar. She was known for her big heart and generous spirit and loved doing for others. Her trademark smile would light up any room she entered. Reine excelled at her greatest pleasure in life,being the perfect wife and mother. Reine was predeceased by her loving husband Eddy and her mother Marie Louise Bercier, her father Ludwig Louis Bercier, her brother Guy Roland Bercier, her sister Isabelle Gomez and her nephew William Gomez. She is survived by her devoted daughter Pamela and many nieces, nephews, cousins and friends in France. Calling hours will be Friday, March 23 from 4 -7 pm at Ray Funeral Service, 59 Seaman Ave., Castleton, NY. A Mass of the Resurrection will be held at 10 am Saturday at Sacred Heart Church, 3 Catholic Way, Castleton-on-Hudson, NY with burial to follow at Sacred Heart Cemetery. All are invited for a reception following, at the Sorokey residence. Donations in Reine’s memory may be made to the animal rescue centers of your choice..